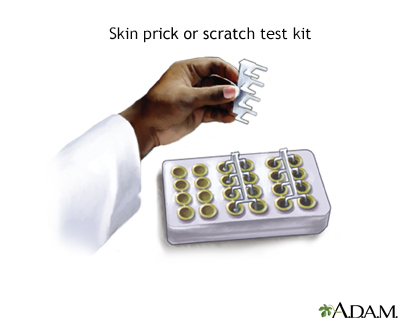 One of the most common methods of allergy testing is the scratch test or skin prick test. The test involves placing a small amount of the suspected allergy-causing substance (allergen) on the skin (usually the forearm, upper arm, or the back), and then scratching or pricking the skin so that the allergen is introduced under the skin surface. The skin is observed closely for signs of a reaction, which usually includes swelling and redness of the site. With this test, several suspected allergens can be tested at the same time, and results are usually obtained within about 20 minutes.